The other day I was brewing a potful of tea in a one-quart teapot , and instead of adding about two heaping teaspoons of Mellow Monk tea, I decided to try adding only one teaspoon and then letting the tea steep a little longer—and I was very pleased with the results! Porcelain teapots are nice, but a glass one lets you monitor the tea level so that you know when you're running low. 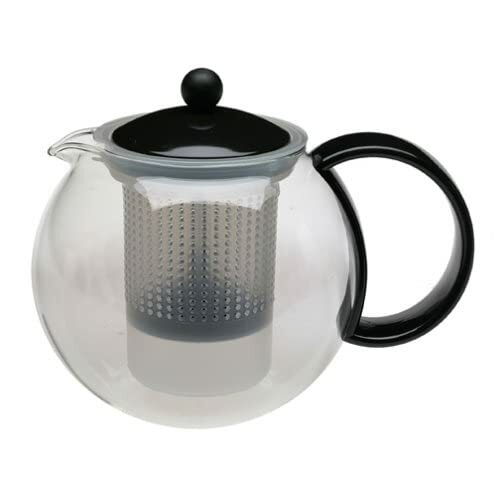 As an added bonus, this Bodum teapot has a built-in tea press, so that you can push down the press and "pause" the brewing process once your potful of tea has steeped long enough. When you brew another potful with the same leaves, you simply raise the press and add more hot water.